A significant constraint on plant and crop productivity are rates at which nutrients (carbon and nitrogenous compounds and minerals) are transported across plasma membranes (PMs) of cells that acquire nutrients from the soil solution and of cells that load/unload vascular pipelines that convey acquired nutrients from sources (net nutrient exporters; e.g., fully-expanded leaves) to sinks (net nutrient importers; e.g., developing seeds and fruits). Nutrient transport rates per cell are the product of their PM transporter densities (activity) and PM surface areas in which the nutrient transporters are embedded. Transfer cells (TCs) are the most evolutionarily advanced cell type specialized to support high rates of nutrient transport across their PMs. The transport capacity of TCs is conferred by an amplified PM surface area, enriched in nutrient transporters, arrayed on an invaginated wall labyrinth, commonly polarized to the direction of nutrient transport. The degree of wall labyrinth invagination, and hence PM amplification, is determined by the number of repeating fenestrated layers of vertically-oriented wall ingrowth papillae (WIs; Fig. 1). Fig. 1. A. Light micrograph of a transverse sectionof epidermal transfer cells (etc)of a Vicia faba cotyledonillustrating the thick band of wall labyrinth (purple) polarized to the outer wall of each cell. B. Scanning electron micrograph of a freeze fractured cotyledon with the cytoplasm removed showing the reticulate invaginated wall labyrinth (black arrow). C - H. Wall labyrinth assembly in epidermal cells of cultured V. faba cotyledons. C, D. Transverse (C) and cytoplasmic face (D) views of the uniform wall (brackets in C) from which WI papillae arise (darts in C, D). E. Transverse section of a WI papilla showing electron dense cellulose microfibrils (arrow) ensheathed by an electron translucent band of callose. 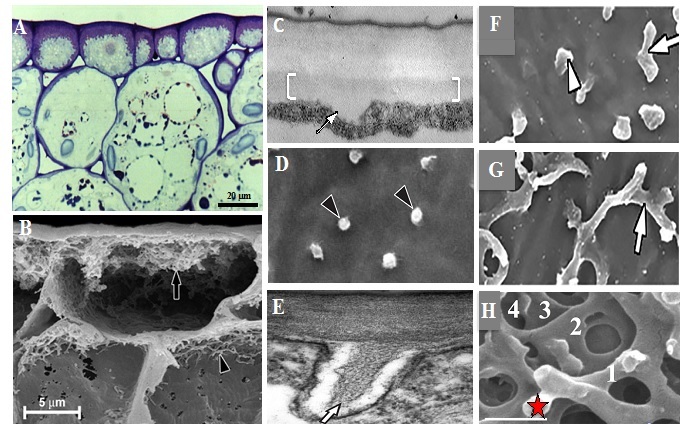 F, G. WI papillae ultimately bend (F, dart) and fuse (G) to form the first fenestrated wall layer (G - arrow) from which another set of WI papillae arise (H-star) H. Cytoplasmic view of a multi-layered fenestrated network of a mature wall labyrinth (fenestrated layers are numbered; star indicates emerging WI papilla). Bar = 1 µm in C, D, F, G; 2.5 µm in E, H.
Currently our focus is to discover signalling cascades, and the down-stream machinery, responsible for assembling the TC wall labyrinth. A parallel phase of enquiry, yet to be activated, is to elucidate mechanisms regulating the expression of key transporter proteins and their subsequent targetting to, and embedding in, the amplified PM. Progress in studying TC biology has been impeded by impaired experimental access to these specialized transport cells that characteristically occur in low numbers embedded deep within tissue matrices. This impasse has been breached by our development of a TC induction system using cultured V. faba cotyledons. The system offers access to a large population of uncommitted epidermal cells that, upon transfer to culture, are synchronously induced to rapidly (h) trans-differentiate to a proven TC morphology and enhance nutrient transport capacity (Fig. 2). 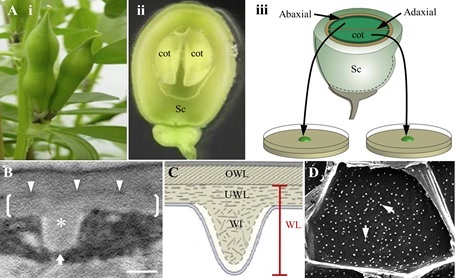 Exposure of cotyledons to pharmacological blockades of the inductive signals creates opportunities to experimentally perturb trans-differentiation at specific developmental stages of wall labyrinth assembly. Peels of trans-differentiating epidermal TCs (ETCs) can be obtained in sufficient quantities for cell-specific gene expression studies and to quantitatively determine the extent of wall labyrinth development by SEM/FESEM using our dry-cleave method. The former has permitted the generation of valuable comprehensive transciptomes of ETCs at specific stages of wall labyrinth assembly as well as transcriptomes of ETCs in which key signals have been pharmacologically blocked. Live-cell imaging of fluorescent-tagged proteins and their signals is available through spinning disc and confocal microscopy. This capacity will be strengthened by developing a transient transformation system that currently has reached proof of concept with colleagues at La Trobe University. Through an international collaboration, we have access to a V. narbonensis stable transformation system to characterize the functional significance of putative key protein players as components of the regulatory mechanism controlling ETC development. Fig. 2. A.Schematic of V. faba cotyledon culture system illustrating (i) pods prior to harvest, (ii) a seed, cut in half longitudinally, showing the coat (Sc) enclosing two “sister” cotyledons (cot), (iii) “sister” cotyledons removed from the seed coat, are separated and placed adaxial epidermal surface down on the culture medium. B, C. Transmission electron micrograph (B) and diagrammatic representation (C). of a transverse section of the outer periclinal wall of a trans-differentiating adaxial epidermal transfer cell. Brackets in B mark the uniform wall layer (UWL) deposited on the original wall (OWL) and demarcated by an electron-dense band (darts in B); a wall ingrowth (WI) papilla is marked with an asterisk in B. D. Scanning electron micrograph of WI papillae deposition at the cytoplasmic face of the outer periclinal wall of adaxial epidermal cells. Each white dot represents a single WI papilla (arrows). The white arrow in B indicates the direction of imaging of the cytoplasmic face. Bar, 300 nm in B and 10 μm in D.
Given that TCs are located within the plant body at specific sites of intense nutrient transport, combined with the complexity of their wall labyrinth assembly (Fig. 1), we envisage a multiple-layered regulatory system controlling TC development. Broadly we propose the system comprises an interplay between a cohort of primary signals that switch on a gene network that drives formation of a central signalling hub which in turn regulates temporal expression of cell wall biosynthetic machinery involved in, and provides positional information for, the assembly of the intricate wall labyrinth. Our cell and molecular studies of epidermal TC development in cultured V. faba cotyledons have discovered the following elements of the proposed multi-layered regulatory system. These have been organized into a working model (Fig. 3). A complex cascade of primary signals funnel to transcriptionally activate ethylene biosynthesis and a signalling pathway that elicits an extracellular reactive oxygen species (ROS) signal polarized to the outer periclinal domain of the ETCs. The latter initiates cell wall biosynthesis and directs polarized assembly of the uniform wall layer independent of the cytoskeleton. Cross-talk between the ethylene/ROS signals orchestrates formation of inward-directed plumes of elevated cytosolic Ca2+ ([Ca2+]cyt) that define punctate domains at which WI papillae arise from the uniform wall layer. Genes encoding proteins contributing to generating the ROS and Ca2+ signals along with those synthesizing the callose sheath and cellulose microfibrils have been identified. We envisage these key proteins undergo rapid and profound temporal and spatial changes in the outer periclinal domain of the trans-differentiating epidermal cells to ensure the ordered sequential assembly of the structurally-complex wall labyrinth. Fig. 3. A working model of mechanisms proposed to regulate the spatiotemporal dynamics of key plasma membrane (PM) proteins responsible for assembling the wall labyrinth of epidermal transfer cells of cultured V. faba cotyledons. The working model (Fig. 3) provides the conceptual framework for formulating current and future projects designed to discover the mechanisms regulating wall labyrinth assembly. Many questions remain, for example: What is the role of sterol-enriched plasma membrane domains? How is the ROS signal generated?